Gabriela Lopez* used to be shy. So shy that she would stay home from school because she didn’t fit in. So shy that she got D’s and F’s on her report card because she didn’t speak up or ask questions. “I didn’t know how to act around people,” she said. Not a trace of that shyness remains. Gabriela, “Gabi,” and her mother moved to the U.S. from Mexico about six years ago to escape a bad family situation. Gabi’s mother feared for their safety, and the two landed in Apex to start fresh. “It was very difficult because I didn’t know anything about the culture or what people here did, or how they communicated with each other,” Gabi said. 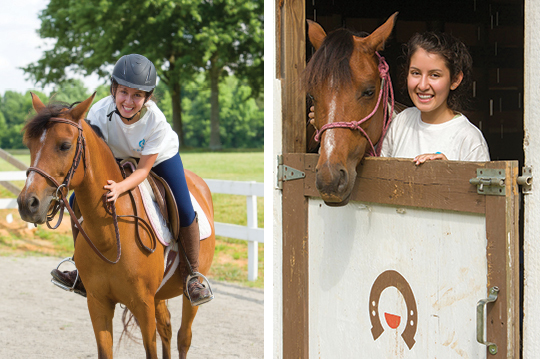 Gabi’s mother heard about Cary-based Corral Riding Academy through her job, and immediately encouraged Gabi to apply. 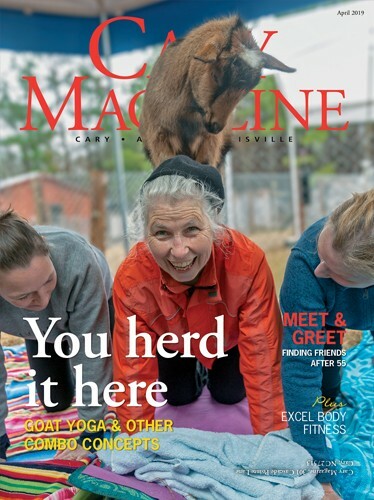 Corral is a nonprofit group that uses horsemanship skills, tutoring, mentoring and equine-assisted therapy to transform the lives of struggling girls. Corral’s participants face great challenges — court involvement, family instability, academic failure and withdrawn behaviors. But the program’s long-term, holistic approach is transformative for many of its riders. At first, Gabi was hesitant. “I was very nervous. I barely knew the culture, let alone coming in here and working with a horse. I’d never really been with horses in my life,” she said. Now 16, Gabi has been in Corral Riding Academy for five years. She is engaging, outspoken and confident; makes A’s and B’s in honors courses at Holly Springs High School; and is the program’s most accomplished rider. “Corral gives me a lot of support,” Gabi said. “Whenever you need a tutor, there’s a tutor. Whenever you need that word of encouragement, there’s a lot of people here that will give it to you. None of Corral’s participants have experienced further court complaints, more than a third of the girls have shown improvement in their grades, and more than 75 percent have shown an improvement in emotional well-being. Gabi’s favorite part of Corral is riding. She’s participated in several horse shows with Corral, but one of her earliest riding experiences could have turned into a setback — she fell. Gabi was back in the saddle that very day because there wasn’t any other option, she said. Get up, dust yourself off and ride on. Most often, Gabi rides horses named Giselle or Ruth, both described as “sassy mares” by executive director Currey. “Gabi works very successfully with both of those horses because she is able to stand up for herself and advocate for herself,” Currey said. Corral’s horses have complicated histories too. They are all rescues, often coming from abusive situations, neglect and malnourishment. Like the girls in the riding academy, the horses have to learn confidence, trust and to take pride in themselves. Corral emphasizes independence, accountability and commitment, so the girls, like Gabi, are equipped to advocate for themselves after their time in the program ends. Gabi displays strong leadership skills at Corral and in school, said Currey. She received a school-wide award for Excellence of Character in ninth grade and enjoys helping the newcomers to the riding academy. Now Gabi aspires to be an attorney. After witnessing her mother’s struggle to start a new life for her family, Gabi dreams of helping women in similar situations. “It’s really inspirational to see how she’s taken her own difficult experiences and they’ve been a motivating force for her to become this amazing young woman,” Currey said. *Name changed at the request of family.